Whenever I see my sister, Reen, we inevitably wind up discussing recipes. Most times she tells me of something that she made that was SO good, that everyone LOVED. And most times it was something she just threw together and probably wouldn't be able to recreate if her life depended on it. I keep telling her "Write it down, take a picture of it, and send me the recipe!" Well, finally, she did! And it's fabulous! To be honest, I have no idea of this is Reen's recipe or if it belongs to someone else, but as I always say, she's the one who brought it to me, so she's the one who gets the credit! It's an easy dinner that's ready in no time! Just throw everything together the night before, and let it marinate until you get home from work the next day. It's ready in as little time as it takes to cook the rice. Easy! It's the perfect Fall dinner. Cut pork off bone (if there is one). Cut into strips. Mix garlic, soy sauce, sherry, ginger and onion. Add pork. Marinade overnight. Peel and slice apples. 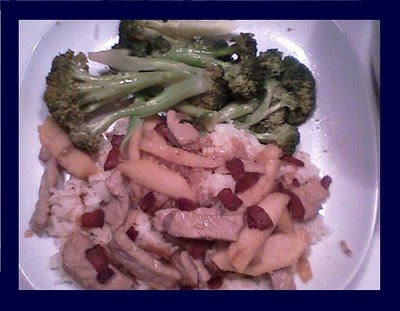 Saute pork in vegetable oil. Add apples. Cook until tender. Serve with rice. Top with crumbled bacon, if desired. Choose an apple that holds up well when it's cooked, such as Granny Smith. As much as I love Macintosh or Golden Delicious apples, they'll just break down and become mushy when you cook them. Serve with any green vegetable, such as steamed broccoli, Roasted Asparagus, or Caramelized Brussels Sprouts. When serving rice, instead of using plain white rice, try different kinds! (lately, I've been using Jasmine rice quite a lot. Love it!) Also,cook it in vegetable or chicken stock instead of water. You won't believe how much more flavorful it'll be!